The dollar is weaker amid a relatively quiet session. 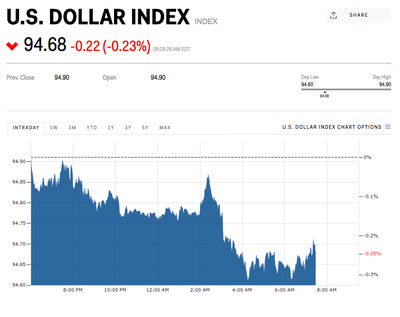 The US dollar index was down by 0.3% at 94.67 at 8:39 a.m. ET. The Federal Reserve is meeting later this week, and will be out with its latest monetary policy decision on Wednesday. “When it comes to the Fed though, it may not be the interest rate decision itself that attracts the most attention, rather President Donald Trump’s announcement on who will succeed Janet Yellen as Chair from February, with the incumbent still in the race,” Craig Erlam, senior market analyst at OANDA, said in emailed comments. The British pound was up by 0.5% at 1.3195 against the dollar. Separately, Germany’s financial regulator, BaFin, is demanding that British insurers inform it of their “emergency” plans for the worst-case scenario when it comes to Brexit. The Russian ruble was up by 0.6% at 57.7391 per dollar, while Brent crude oil, the international benchmark, was higher by 0.3% at $US60.32 per barrel. The euro was up by 0.2% at 1.1629 against the dollar. Spanish GDP rose by 0.8% quarter-over-quarter in the third quarter, in line with expectations, but down from the previous reading of 0.9%. The Japanese yen was little changed at 113.57 per dollar. Retail sales in Japan rose by 2.2% year-over-year in September, below expectations of 2.5%. The Indian rupee was little changed at 64.874 per dollar.